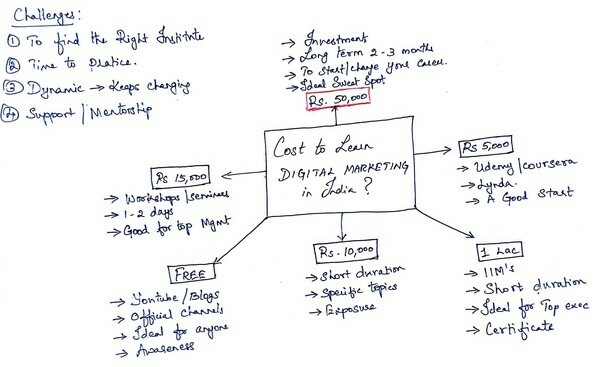 A recent question from QUORA: How much does it cost to learn digital marketing in India? 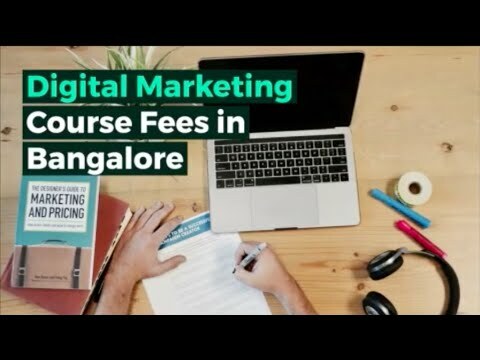 In this blog post let me break down the average cost to learn Digital Marketing in Bangalore and other parts of India. If you have the dedication, discipline and ready to put in time and effort you can learn it free. The challenge with that is we all know if we spend time watching videos we will learn but most of can’t. It’s like working out we all know if we workout we will be fit but not everyone works out. Today there are a ton of free resources online. I have written a #QUORA answer here: Suresh Babu’s answer to Where can I find free digital marketing courses? some of us have tried it but most of them who learned online still are not confident not because of the content, and there are many reasons for it. one of the reason is the culture we grew up in a way that we always someone to validate what we are doing. Good product or services comes with the cost. This might be your ideal option if you are looking for a decent career option. Keep in mind the fees alone will not take you where you want to go, Practice, perseverance, patience, willingness to test, making mistakes and learning from mistakes should be accompanied. This is your career it’s important and this where your research help. And I have a guide for anyone who wants to find the right institute. This will save you time and money and help you make an informed decision, so if there is one takeaway from this answer it would be this: Suresh Babu’s answer to Which is the best Digital Marketing course in India? Why Rs 50,000 – Rs 70,000? Please note, Web Marketing Academy Bangalore (WMA India) also provide Hands-on classroom training in Indira Nagar Bangalore with Weekday/weekend batches. Rated Best Digital Marketing Training Institute in Bangalore for Class Room Training by our Alumni & Students. Our courses go anywhere from 2–3 months and the cost is Rs 49,000 + GST = Rs 57,800 which can be paid in Instalments and Loan facility available. In this option, you have digital marketing provided by IIM’s and top B Schools. Is it worth it? Well if you are a top-level exec who want to get an idea about Digital Marketing you can, mostly these are short-term courses, as mentioned above, Digital Marketing is a vast topic. You won’t be able to learn in one week. And if you care for the certificates, then you can go for this option. I am an alumnus of IIMB and IIMC. I have written a QUORA answer for that too here: Suresh Babu’s answer to How good is the short duration “Digital & Social Media Marketing and Analytics” course at IIM-B? The Best Digital Marketing Training Insititute might NOT be the Best for YOU!